I have discovered the Writer’s Paradox. And yet, if you drink two glasses of wine, you cannot type. Actually, Coral Tree Cafe, named for the gnarly trunked coral trees along San Vicente, used to be a great spot about a year ago – with its outdoor seating, some on the East side of the building under a canopy for those of us who are afraid of skin cancer, and some seating on the patio that faces San Vicente under the bright late morning/early afternoon sun. It was a great spot for people-watching, if watching slight variations of very wealthy young Brentwood couples pushing their 1.25 children in an $900 Bugaboo is your idea of people-watching. I used to go, order a glass (or two) of wine, ride on their free wireless, and write. But it’s not so great anymore. As a place, that is. Coral Tree Cafe is a “scene.” *gag* Bentleys roll up to the valet and are parked right away, because the valets park those babies right out front, and if the next car in line is a Toyota Corolla, then you have to wait behind it as the valets drive it off to park it underground in the structure up the street. The patios are still great for people-watching, but the scenery has morphed from students and other Brentwoodies who rolled out of bed, threw on a cap and a sweatshirt to grab an espresso and croissant to ridiculous bug-eyed sunglassed girls in trendy wrap sundresses drinking the coffee in front of them, only picking at their boyfriends’ salads, and occasionally tending to a toy yorkie in their over-sized Balenciaga bags. The place is overrun by “The Beautiful People” who just take up space on the patio real estate. And they certainly would never sit inside, or even on the side, covered patio, where no one could see them. 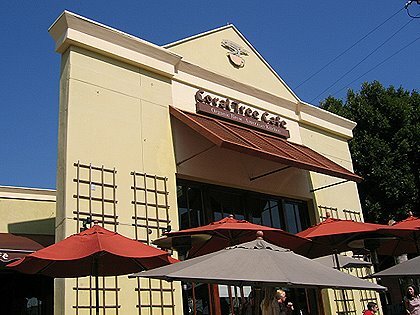 But even though San Vicente is the new Sunset Strip, the food at Coral Tree Cafe food is still just as awesome as the first few gazillion times I went there within the first six months of its opening. The restaurant is always full of people no matter what time of day it is, but the interior is airy and spacious, so it doesn’t feel crowded or cramped, just busy and energetic. Tables are on a “first come, first served” basis, so it is wise to stake out a table first, whether inside in the dining room that feels like a country kitchen or on one of the patios, and claim it by leaving your things there. Don’t worry, this is Brentwood. No one will steal your stuff because more than likely, their stuff is better than yours. Ordering is done at the counter. The perpetual line snakes away from the register, through shelves of gourmet of products – wines, imported crackers, and teeny, tiny “omghowcute!” tins of mints and candies that are totally unneccessary but cannot be resisted by our inner Hello Kitty – and sometimes reaches as far back as the side door. 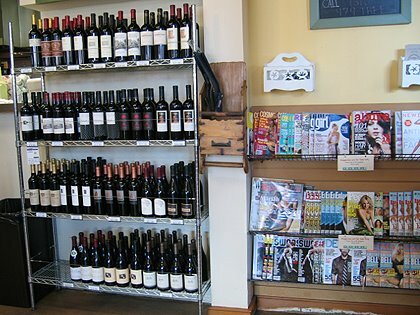 Service is fast and efficient, and the wait time is usually just long enough to scan the magazine rack for something to read later, browse the shelves, and of course, examine the menu, which is also written out on chalkboards above the counter. Coral Tree Cafe’s “thing” is organic teas and coffee, but I am always a simple girl when it comes to coffee. I just order a brewed coffee, though I am sure there is a reason why people rave about the espresso-based drinks. Some mornings, all I need is one of the sizeable, butttery, flaky croissants to give me license to sit at a table with my open laptop for as long as I can make the croissant last (not long, usually). 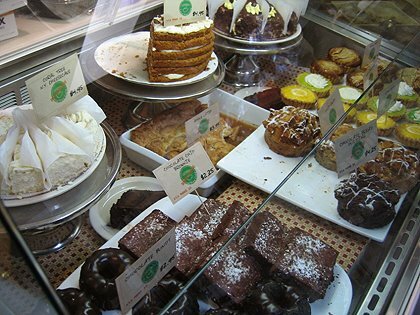 I have yet to try anything out of the dessert case, though every time I am there, I stare into it with longing the way some girls would stare into the show window at Tiffany’s. The multi-layer carrot cake with cream cheese icing oozing from the sides looks deliciously messy. But the real reason I brave the “scene” at Coral Tree Cafe is their offering of breakfast dishes from the kitchen. Looking at the menu headings, it seems like the dishes are standard to any “American” breakfast place – scrambles and various other eggs, pancakes, French toast, cereal and oatmeal, and typical sides like toast, fruit, potatoes, and bacon. However, a closer look at the individual items kind of makes you want to have a Bellini with your breakfast. Eggs Marcella has pancetta, spinach, mushrooms, onions, sun-dried tomatoes, and penne pasta. Scramble Alla Checca is made with bufala mozzarella, fresh tomatoes, and basil. It isn’t cheap, as the egg dishes are all close to $10, but come on. Pancetta. And for goodness’ sake, with the penne pasta in there, you don’t have to eat again for three days. Sure, granola is good, if you’re into that stuff, and definitely accessorizes well with your organic-soy-foam-no-foam-lotta-oohlala Chai tea latte. I also think that the French toast is faaaabulous – buttery Brioche as thick as an Econ 1 textbook, coated in egg-rich batter, and dusted with sugar that certainly doesn’t stop me from dousing it with enough syrup to make a maple tree faint from fear. I am scared to order the Lemon Ricotta Pancakes for I may shriek and scare all the under-five children. But the breakfast that would convince me to shave my head, strip down, and streak all the way down San Vicente to the Pacific Ocean if there was a promise of eating it every day is the Breakfast Panino. I’ve tried the others. The Farmhouse fits the “Paula Deen was here” dining room with bacon, mushrooms, and Cheddar cheese. Siciliana, pancetta, roasted red peppers and sun-dried tomatoes with mozzarella cheese, makes me want to order a Bellini, and just the name St. Tropez makes me want to slip into a white sundress and saunter across the beach barefoot. Every time I go to Coral Tree, I am torn. I cannot decide which to order because they are all so good. I am conflicted, and treat the decision as if it is the last time I will ever get to eat a breakfast panino, and I better make the right choice. They are all the right choice. if you shop on Amazon starting from here, TDL gets a teeny tiny affiliate commission!